Outside my Window…Well, I can’t see out the window just now, since I’m creating this post at the end of the day. I did step out on the front porch just now to take a deep breath of the brisk, fresh air, though. We have returned to our usual temperate, moist winter weather. No more snow. No more flooding. The challenge now is the temps that dip below freezing at night. If it’s foggy, as it is tonight, that fog becomes black ice on the roads. I am thinking…of getting a little bowl of ice cream with chocolate syrup for dessert. This is a favorite dessert, or else a cup of hot cocoa. Tonight, the ice cream won. From the learning rooms…I’ve been enjoying working with some 6th graders on writing short stories. Did you know that slightly modified movie plots and TV shows make a handy-dandy story when all else fails? It’s a beginning, anyway! I am thankful for…my husband cheering me up when I was feeling down. 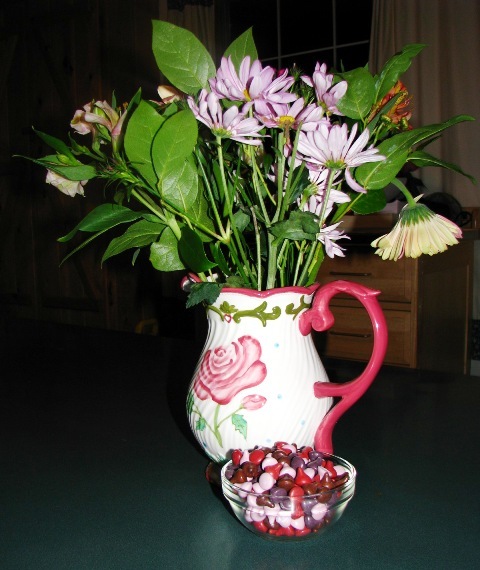 Thank you, Sweetie, for the cheery flowers and the candy-coated chocolate ‘kisses’! From the kitchen…Tonight I made chili con carne, which we enjoyed with shredded cheese, sour cream and crackers, a quick dinner ‘thrown’ together after taking my mom to an appointment. I am wearing…a cozy, long-sleeved deep lavender/pink/grey striped top with lavender sweater over, black skirt, and black leggings (work clothes). I am reading…about a girl who was born with only the right side of her brain, and how that impacted her learning and personality, in the book The Brain That Changes Itself by Norman Doidge, M.D. If you are interested in learning disabilities, and some phenomenal stories of people who have overcome them, you would enjoy this book. I am hoping…to get back in the habit of taking a daily walk, now that the weather is milder. I am creating…Well, I’ll be putting fresh sheets on the bed in a bit. The laundry is done. The family is fed. So, I could say I’m creating a neat, well-run household. I am hearing…my daughter Laura talking to me about a photo she took, my son Seth popping in to tell me how much he enjoyed the ending of Wall-e and other family members laughing in the kitchen. Hmmm….other people must be thinking of getting a bite of dessert, too. Around the house…activities are winding down. We’ll all be going to bed soon. The day’s work is done, and rest will be sweet. One of my favorite things… is Celtic music. My husband just came into the office and turned some on. We’re listening to the trio, The Espers. A Few Plans For The Rest Of The Week…Since sports activities were canceled during the snow days and the flood days, Seth and Lydia will be playing two basketball games each this week, and Rebecca will be playing indoor soccer. I will be helping my friend Sue prepare food for a church supper on Wednesday. We’re doing ‘breakfast for dinner.’ Yum!